Virtualization and cloud (IaaS, Infrastructure as a Service, in particular) have forced the need for automation of some kind. In the old days, the "Iron Age" of IT, infrastructure growth was limited by the hardware purchasing cycle. Since it would take weeks for a new server to arrive, there was little pressure to rapidly install and configure an operating system on it. We would slot a disc into the server and then follow our checklist. A few days later it would be ready to use. But the ability to spin up new virtual machines (VMs) in minutes required us to get better at automating this process. Server image templates and cloning helped get us over the hump. But now we had a new problem. Because we could, assuming enough overall capacity, effortlessly spin up new VMs, we found ourselves with an ever-growing portfolio of servers. The need to keep a constantly growing and changing number of servers up to date and avoiding Configuration Drift spawned new tools. CFengine, Puppet, and Chef established a new category of infrastructure automation tool that was quickly adopted by nimble organisations who were taking full advantage of IaaS cloud as it emerged. These organisations, whose IT was typically built around Agile and Lean mindsets, evolved "Infrastructure as Code" practices to manage their automated infrastructure. 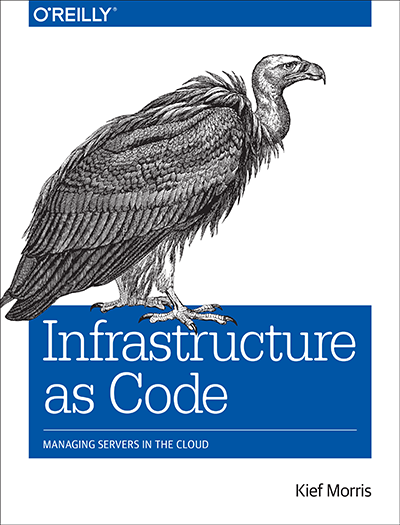 The essence of Infrastructure as Code is to treat the configuration of systems the same way that software source code is treated. Source code management systems, Test Driven Development (TDD), Continuous Integration (CI), refactoring, and other XP practices are especially useful for making sure that changes to infrastructure are thoroughly tested, repeatable and transparent. The problem is that few of these toolsets are designed to support Infrastructure as Code. Yes, they automate things. Once you point and click your way through their GUI to create a server template, you can create identical instances to your heart's content. But when you go back and make tweaks to your template, you don't have a traceable, easily understood record of the change. You can't automatically trigger automatic testing of each change, using validation tools from multiple vendors, open source projects, and in-house groups. In short, rather than using intensive, automatically enforced continuous change management, you're stuck with old-school, manual, "we'd do it more thoroughly if we had time" change management. Infrastructure automation makes it possible to carry out actions repeatedly, across a large number of nodes. Infrastructure as code uses techniques, practices, and tools from software development to ensure those actions are thoroughly tested before being applied to business critical systems. The definitions used to create and update system configurations should be externalizable in a format that can be stored in off the shelf version control systems such as Git, Subversion, or Perforce. This enables the adoption of a wide variety of tools for managing, validating, and testing software source code, rather than locking you into a single vendor's toolset. It also gives you a history of every change, along with who made it and (hopefully) why, and the ability to roll back. It should be possible to validate definitions at various levels of granularity, so you can apply a variation of the test pyramid. Quick syntax and code style validations, followed by execution of individual units of configuration, followed by instantiating of VMs that can be validated, etc. This offers the benefits of fast feedback and correction of changes, and is the foundation for Continuous Integration and a building a Continuous Delivery pipeline. Without the ability to ensure that every change is quickly and easily tested as a matter of course, we're forced to rely on people to take the time to manually set up and run tests, even when they're under pressure. Without visibility and openness of configuration changes, we end up locked into the limited toolset of a single vendor, and deprive ourselves of a huge ecosystem of tools for managing software changes. An earlier version of this article originally appeared on Kief’s blog.